Editor’s note: This is the first post in a series designed to explore and bring to life the framework for initiating networked improvement communities (NICs). Each of the following posts dives into one of the domains of the NIC initiation framework, this post outlines the framework itself. The networked improvement community (NIC) concept has captured the attention of a diverse range of stakeholders looking for new ways to address our nation’s most pressing problems of educational practice. Aiming to address practical problems such as the performance and retention of beginning teachers, groups of educators, researchers, and leaders have sought to form intentional networks to structure collective improvement work. These networked improvement communities offer a vision for a particular form of network that unites educational professionals, working in collaboration with researchers and designers, to address high-leverage practical problems. Embodying the “learning by doing ethos” of improvement science, Carnegie has been developing practical “know-how” about this new organizational form by initiating NICs focused on reversing high rates of student failure in community colleges and curtailing the rapid turnover of beginning teachers. As interest in NICs is growing rapidly, demand is also emerging from the education community for further guidance about how to launch networked improvement communities. Responding to inquiries from the field about this practical challenge, we have worked to specify a framework useful to NIC initiation teams in organizing their work. 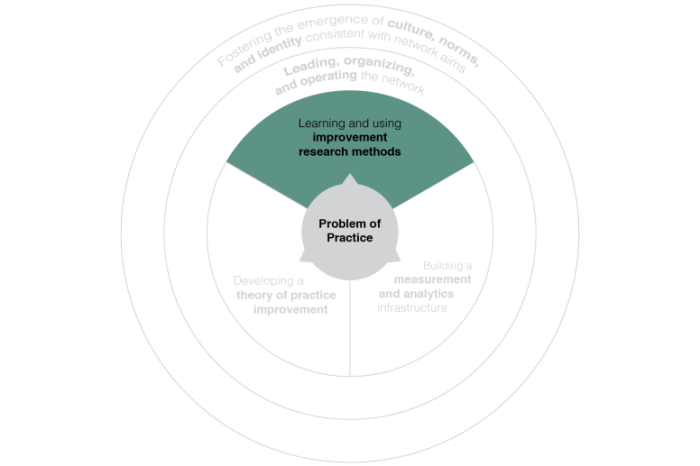 The framework derives from reflection on our practical experience with NIC initiation and is informed by core ideas about networked improvement communities and extant research and theory about launching and operating networks. It is based also on interviews with leaders of prominent large scale networks in education. This process included deep study of cases of emergent NICs as well as established improvement-oriented networks such as Success for All and the National Writing Project. This integrated analytic endeavor resulted in the specification of a framework for NIC initiation. At the center of the framework and the heart of a NIC is a specific problem of practice. The problem of practice is central because it anchors all activity in the NIC and seeks to motivate and galvanize the collective action of participants toward some common accomplishment. In addition, the framework specifies five domains of activity that we believe are essential to the initiation of a viable NIC. By viable we mean a NIC that is well positioned to both sustain operations and achieve its core aim. The figure below presents these five domains and depicts the conceptual relationship among them. Building a measurement and analytic infrastructure that enables the network to track progress toward the aim and learn from efforts to experiment with process improvements. The fourth domain–leading, organizing, and operating the network–is depicted as a circle surrounding the NIC’s technical core. Leadership and emergent organization are critical during initiation, because they lay the foundation for a sustainable organizational structure. It is about how a NIC actually comes into being. Finally, the outermost layer of the framework–fostering the emergence of culture, norms, and identity consistent with network aims–refers to the characteristics of a network and the context in which it resides that enable the sustained voluntary engagement and discretionary effort of participants. Members join together as a practical scientific community. They share a “common language” (i.e., description of the problem to be solved and working theory of improvement), common measures, and common inquiry protocols and evidence about what they tried and what they learned. Included here is the narrative of participation that motivates this distinctive form of professional collaboration and defines what it means to be a member of a particular NIC and how participants will work together to address their shared problem. While culture, norms, and identity are emergent properties of a NIC, a network initiation team must take strategic action to foster their development. In positing the framework, we argue that the developmental activity described in all the domains is essential to NIC initiation. In other words, we assert that if each activity is not meaningfully addressed during initiation, a productive NIC is not likely to fully form and sustain its efforts. This post kicks off a series that will focus on practical issues relevant to the challenge of NIC initiation. Drawing on the reflections from initiation teams actively engaged in launching NICs, we will highlight lessons learned related to culture formation, building core capacity for improvement work, developing a theory of improvement, and NIC management and operation, as well as navigating complex external environments. 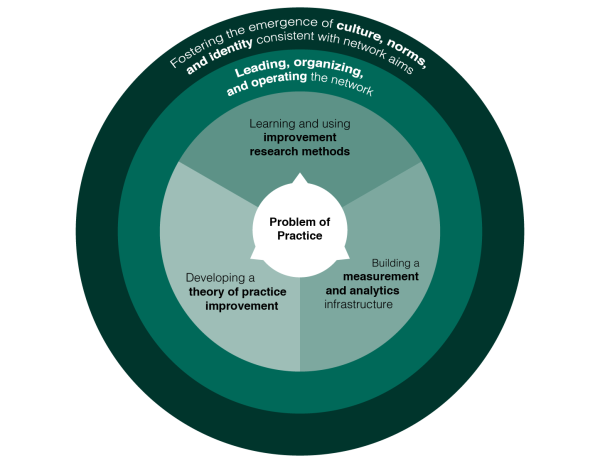 In so doing, we hope to advance the field’s attention to the strategic activity required to stimulate a productive network focused on the application of improvement science to problems of practice. In “Proof,” Policy, and Practice: Understanding the Role of Evidence in Improving Education, Paul E. Lingenfelter discusses differing ideas around what is considered “proof” of improvement in education and how to make it more actionable.